I have a confession to make, and it will rock the foundations of everything you have known or will know – I am a big fan of science-fiction (I might have embellished a bit, if that shook you to your core it’s time to find a new core). My all-time favorite sci-fi series is Star Wars, but I also enjoy Star Trek (The Original Series all the way). One thing that I like just as much or more (in some cases) than these franchises are the spoofs that are borne out of them. It’s important to note that not all spoofs are created equal. Some miss the point of the films entirely, but others – the ones in this list, for instance – are absolutely wizard (bringing it back). Mel Brooks is a comedic genius and if you say otherwise then you better have one hell of a good argument to support your position (I expect charts, spreadsheets, and pivot tables). Due to my appreciation of sci-fi this is probably my favorite movie of his. From characters to merchandising (Spaceballs the FLAMETHROWER), Spaceballs goes after everything Star Wars. 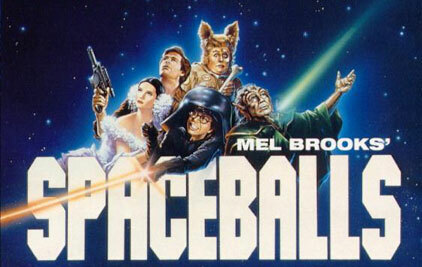 Spaceballs follows Lone Star and Barf as they try to rescue Princess Vespa from the tyrannical Dark Helmet. You know the movie has comedic potential when the “terrifying villain” is played by Rick Moranis, and the late John Candy plays the Chewbacca-esque sidekick. Bill Pullman also does a good job trying to emulate Han Solo while flying a Winnebago, which is no easy task! If you have a Netflix subscription you can stream it instantly. I highly recommend it. 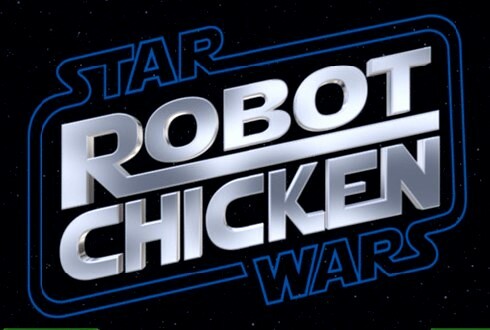 The Robot Chicken Star Wars Specials get better and longer with each entry. The first one is relatively short, but is totally worth a watch. The second and third installments are absolutely hilarious. Seth Green goes out of his way to include some pretty obscure references and even brings in Billy Dee Williams (Lando Calrissian), Anthony Daniels (C-3PO), and Ahmed Best (Jar-Jar Binks) to voice their own characters. Robot Chicken, for the uninitiated, is a stop motion variety show created by Family Guy’s Seth Green. The regular show includes characters from all over Pop Culture, but also has three Star Wars Specials and one DC Comics Special, which is also really good (Aquaman is made fun of the ENTIRE time, so Bill isn’t really a fan). The Specials also include voiceovers by Mila Kunis, Seth MacFarlane, Zach Efron, and Scrubs’ Donald Faison. This is the only novel on the list, and it is freaking incredible. 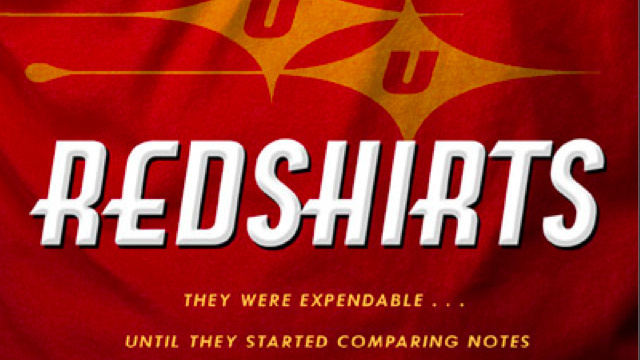 I first heard about Redshirts while listening to an interview with the author, John Scalzi, on NPR. The novel follows Andrew Dahl, an Ensign who has just been assigned to the Intrepid (think Enterprise) the flagship of the Universal Union. He and the other new recruits begin to notice that on every away mission at least one low-ranking crewmember dies, while the famous senior officers (think Kirk, Spock, and Bones) always survive, although Lt. Kerensky always seems to be horribly maimed or infected with some exotic disease yet always recovers in a matter of days. The non-senior members of the crew begin to be very superstitious of the away missions and do everything in their power to not be on the away team. Eventually the Ensigns discover the reason for their ill fate, and must try to find a way to put an end to their lot as cannon fodder. Redshirts won the 2013 Hugo Award for Best Novel, and for an added bonus the audiobook is narrated by Wil Wheaton. Galaxy Quest is another great Star Trek parody. The movie follows the cast of the once-popular, fictional sci-fi series, Galaxy Quest years after it was canceled. 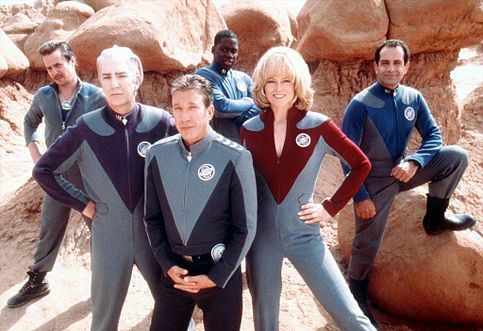 While the fictional cast, played by Tim Allan, Sigourney Weaver, Alan Rickman, Tony Shalhoub, Sam Rockwell (who was an unnamed character who was the equivalent of a Redshirt), and Daryl Mitchell are attending a Galaxy Quest convention they are convinced by a group of aliens called the “Thermians” to come aboard their ship (which was made to look exactly like the Protector, their ship in the series). At first they think it is an elaborate joke, but begin to realize that the Thermians believed that the reruns of their TV show were actual historical documents detailing their real adventures. The cast must quickly become the characters they portrayed to save the Thermians from the evil warlord, Sarris. J. J. Abrams called Galaxy Quest one of the greatest Star Trek films ever made despite its parody status. This is the first of a trilogy of film’s by Seth MacFarlane spoofing the original Star Wars trilogy. I am only adding the first of the three to the list because I think the subsequent films were pretty weak in comparison. 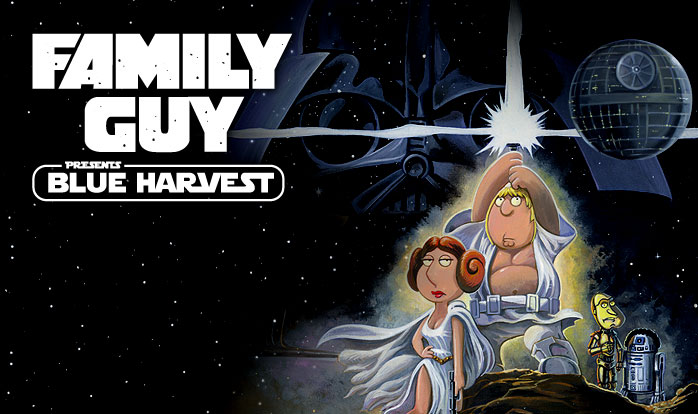 Blue Harvest is almost a frame for frame reproduction of Star Wars: a New Hope, except with loads of Family Guy humor. Peter Griffin is Han Solo, Lois is Leia, Chris is Luke Skywalker, Bryan is Chewbacca, and Herbert (the creepy old guy) is Ben Kenobi. Meg is in the movie too, although she only has one scene as the Dianoga in the trash compacter (the one-eyed tentacle monster that tried to drown Luke). They call out a lot of the plot holes in a New Hope and it’s a lot of fun, but only if you are a fan of Family Guy. I hope you guys enjoy these incredible parodies. Let me know what you think about the list, and if there are any spoofs you think should’ve been included let us know in the comments. Previous postNew Veronica Mars Movie Trailer! Next postMan of Steel sequel: Wonder Woman’s origin?